Be careful where you walk these days. Everywhere’s dangerous. Full of corners you wouldn’t know what’s hiding behind. Lock your doors. Lock your windows at night always. Lock yourself up. This questing, urgent rhythm, as just one instance of the rhythms that grip the language throughout the play, indicates the probing questioning and self-questioning, the fractured reflections upon memories of an unresolved sometimes abusive past and a volatile timeless present. The future is another country in this experience. There is something dark; there are things unsaid, half-spoken, mostly carried in the baggage of a life here; and it is this continuing contact with realities beyond the words, contained in the multitude of images that cascade in her language, that suggests a life shot through with anguish and locked away deeds of abuse. Joan Kempson is compelling in this role – quiet, calm, raging, gentle, tortured. She has the kind of hypnotic power upon the audience - and I think almost every seat in The Studio was taken - that can happen when one is busily rushing along the city street towards a meeting, a destination, to be stopped in one’s tracks by an insistent stranger voice. She is the Ancient Mariner with a long, complex, dark story to tell of reclaimed innocence, shadowed by the events of her past which snatched away a primordial innocence. Like one on the emotional and mental border between sanity and loss of reason, the baglady here is hovering in the centre of a conversation between the mind that tries to make sense of a lived life, the memories that defy any imposition of right order, and the imagination that transposes the whole experience into the realm of the poetic where images of innocence and darkness collide. She challenges our categories of sense as only those who have moved beyond rationalism can do. This is not dementia; this is the fruit of the ravaged reflections of troubled family, broken piety and marital relationships. It is what art, theatre, can do to interrupt and question ‘reality’. Joan Kempson has skilfully directed her own performance to project the complexity of all this through the cradling yearning of a gentle soul to the outraged anger of a woman who has lived with violence. This technique of dramatic monologue, one character on stage speaking to an audience, to the characters they create in their minds, to themselves, reminds us of Samuel Beckett’s Happy Days (1961) and, in more ordered surroundings, some of the episodes of Alan Bennett’s Talking Heads (1988; 1998). The strategy is akin to a living, speaking dramatic portrait painting, and Joan Kempson used facial and bodily language with subtle variety to create a range of moods as she reconstructed her life. It focuses the audience intensely upon the character. It allows for no alternative ‘reading’ because there is no one else on stage to interject; it is in the spaces of our minds, as we listen and watch, that the story continues to unfold with her questions continuing to disturb any reality brought into the theatre. That, of course, isolates the figure on stage whilst it separates us from the ‘outside’ to enter her world; and here the baglady embraced her world and the audience listening to it even in her solitariness. Her isolation, her wrestling with herself, her demons displayed in public are precisely the elements which most disturb. We may pass by, cross the road, outside the theatre: but inside we are ‘compelled’ to stay seated and listen, not like the Good Samaritan to help, but to become dislocated. There is no help; just a compulsion to stay. The strategy is akin to the moment in a full-scale play, filled with characters, when the main figure stands above and beyond the action, alone on stage like Lear, to make a statement that sends shafts of light and darkness to the heart of the play; only in The Studio it is the intimacy and solitariness of that moment that grips attention as she casts shafts of broken understandings into her life. Almost Chaplinesque – the tramp alone, pondering unspoken tragedies, inviting us to share the resilient humour that provides courage to face experiences too harsh for grieving. …in the end, you stand on your own, and do not look back. Of course, if you believe that, you’ll believe anything. I like that in a person. Just as McGuinnesss wants the play to ‘stand on its own’ whilst we ‘look back’ to make sense of it, the baglady wants to be seen as standing on her own whilst constantly looking back; but she will defy you to rationalise or explain the paradox. The expected boundaries of pity for her are irrelevant because the baglady is constantly rearranging the kaleidoscope of her life to suggest new meanings which immediately slip, often dark; and, like the life itself, these meanings are forever unstable. It would be too easy to say this is a portrait of one on the edge of a form of dementia; too simple, too topical and fundamentally wrong, as many diagnoses of the need to reminisce are. The characterisation we saw with Joan Kempson shows us the profound point that for the most part the past, when viewed from a later perspective, often exists on the edge of sanity, coloured by violence, abuse, control, the demands and actions of others, family, religion, marriage. This play is a vignette – an intense impressionistic portrayal of one woman and the world within her mind, memory and feelings, looking through shattering glass. Two sharp, bold colours – red and black, with the picture of what looked like a mad woman in green: the surreal world where brutality, prayer, blessing and curse collide and where the waters of birth and baptism also become the place to drown. The performance disturbingly leaves us to re-enter the outside world questioning what this lone baglady has told us especially about the institutions that have shaped her life. It is at this point the lone woman is not alone: she has on stage articulated something profound about human existence – with echoes in the idea that life is solitary, poor, nasty, brutish and short. And after the past one hundred years of civilisation, without going any further back in time, who can challenge her? Except, of course, she can still laugh – perhaps wryly, but still she can laugh. 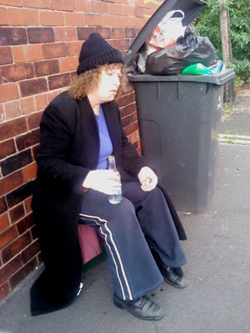 Baglady ends its short run at The Royal Exchange in Manchester on Saturday, 17th March – St Patricks’ Day. The production forms part of the Manchester Irish Festival 2012. This play is more than just a part of a distinguished Irish tradition, though. It connects with the concerns of all for whom the confusions, betrayals and institutions that shape the past are both another country and an ever-present reality.